While Olympic siblings aren't unheard of — in fact, there are quite a few if them competing in Rio right now — the siblings to the athlete everyone knows as "the fastest man in the world" don't appear to share their brother's need for speed. So, what do Usain Bolt's siblings do? 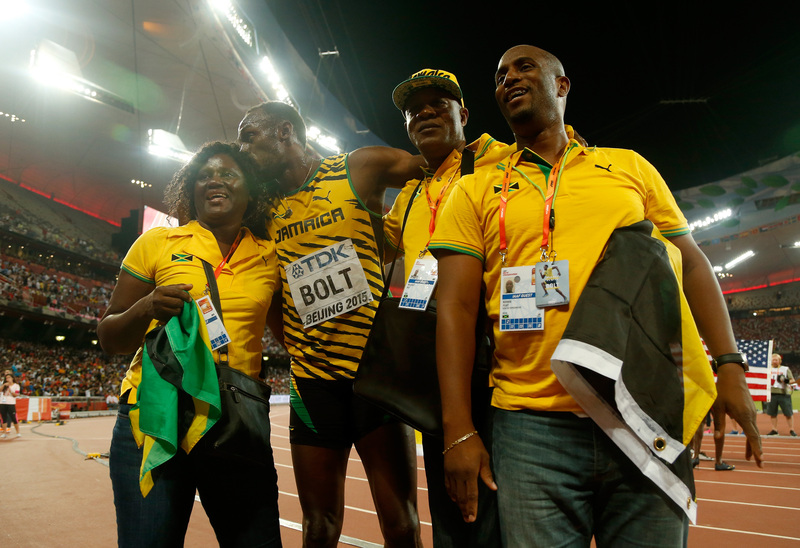 Though they don't compete in the Olympics, athleticism seems to run in the Bolt family. The Jamaican sprinter was raised in the remote village of Sherwood Content while his brother, Sadiki, and sister, Sherine, grew up in nearby Kingston. Although neither Sadiki or Sherine decided to follow their brother into Olympic fame, Sadiki reportedly shares some of Bolt's athletic talents. When Bolt was training to defend the Olympic gold medal he'd won in 2008 in the men's 100-meter at the 2012 Olympic Games, Sadiki was reportedly dreaming of playing cricket for West Indies. "Cricket is a passion of mine," he told the BBC back in 2011. "I really love cricket - it relaxes me. It's good to do something in life that you love and can earn from at the same time." According to Sadiki, while Bolt may be the family's best runner, he's not the dominant cricketer. That title apparently belongs to Sadiki, who's been playing since age 10. While Sadiki appears to share his older brother's confidence and hasn't shied away from the attention Bolt's Olympic medals and world records have brought to the family, hardly anything is known about their sister, Sherine, who has largely managed to steer clear of the media spotlight. How does it feel to be related to a man no one has yet been able to catch, who holds the world record for both the 100- and 200-meter? Sadiki has said, "It's an honor to be the brother of the world's fastest man," but added that he "wanted to do [his] own thing and be [his] own individual." Sadiki appears to be nothing but supportive, cheering on his brother, who took gold medals in both the 100-meter and 200-meter events at the 2016 Rio Games, from back home in Jamacia via social media (where he also dispenses a bit of philosophical life advice from time to time). While it doesn't seem Bolt's siblings will be challenging their brother to a footrace anytime soon (and really, who can blame them? ), his younger brother seems to be one of Bolt's biggest fans. "I'm proud of him because he's carrying the banner for Jamaica right now, and that's not an easy task," Sadiki told the Royal Gazette in 2013 after Bolt's impressive performance in the 2012 Games.